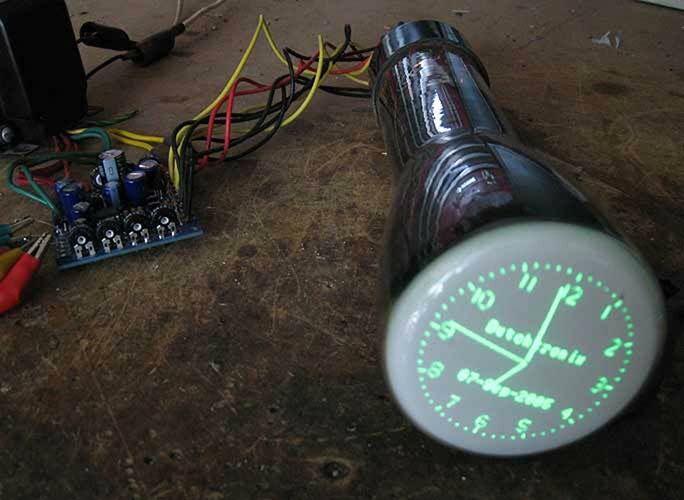 Build your own simple old school cathode ray tube oscilloscope, Lissajous display, or a retro tube scope clock with this simple CRT driver board. 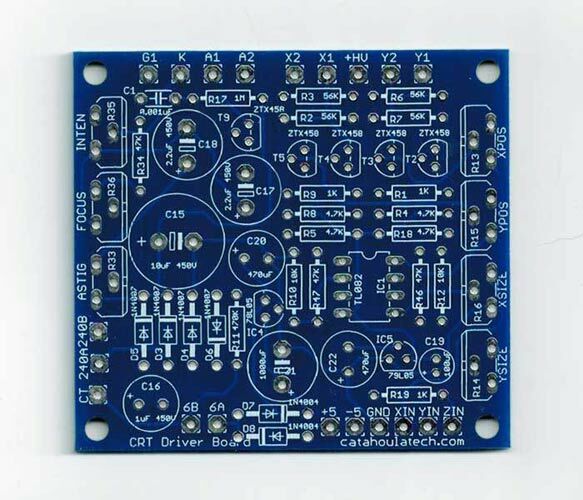 The board is designed to work with various 1 to 3 inch diameter electrostatic CRTs and works well with the Dutchtronix scope clock kit. 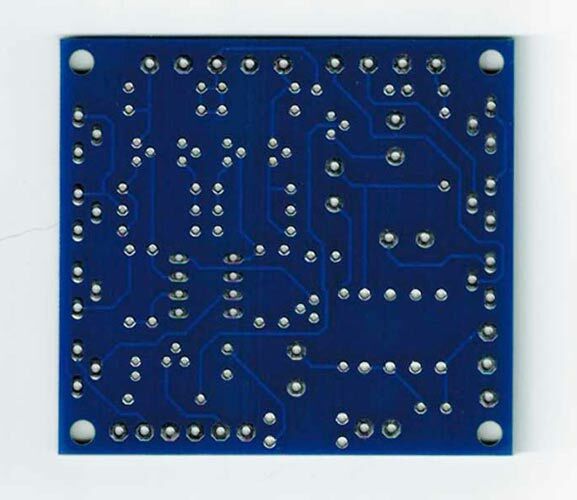 The board contains the necessary power supply circuits to generate the required high voltages for the CRT and includes 3 simple controls for focus, astigmatism, and brightness. Deflection amplifiers on the board amplifies ±5V single ended input signals to differential deflection voltages with straight-forward controls for gain and position. The solid-state design is documented at www.electronixandmore.com. This PCB design is also featured in the September 2014 QST magazine article "A New Life for an SB-610 Monitor Scope" by Dave Cook, WA0TTN. Input sensitivity level for X and Y inputs with circuit operating at maximum gain (XSIZE and YSIZE set to max) has been characterized to be 100-140mVpp per inch on a 3BP1 CRT with a deflection voltage differential of 60-85Vpp, so the overall gain is ~600. Higher input voltages can be tolerated as long as the gain potentiometers are turned down appropriately. The -3dB bandwidth of the design is dominated by two poles. The TL082 op-amp has a fixed gain of 6 and has an unity gain frequency (gain-bandwidth product) of 3MHz, so the -3dB frequency of the op-amp is 3MHz/6 = ~500KHz. The ZTX458 emitter degenerated CS amplifier with the given resistor values has a -3dB frequency at ~300KHz. The board has been characterized to have 1/2 the low frequency gain at ~200KHz. Note that there exists a non-dominant frequency response pole that comprises of the 56K resistors in the deflection amplifiers combined with the CRT deflection plate capacitance that is typically 10-25pF so this third pole is typically >1MHz. For operation with the Dutchtronix scope clock, the CRT driver board +5V terminal can supply enough current for the clock board. Connect CH1, CH2, and ZINV of the clock board to X, Y, and Z inputs respectively of the CRT driver board. The Dutchtronix scope clock kit usually comes with a SIZE potentiometer that may need to be adjusted if there is distortion observed in the display. CAUTION: The board requires a power transformer that operates off mains. It is your responsibility to correctly connect the power transformer to mains safely. The board generates voltages higher than what is supplied by the power transformer by using voltage doublers. Typical DC voltages generated by the board when supplied by a Hammond 270X transformer to operate a 3BP1 CRT are summarized in the following table. 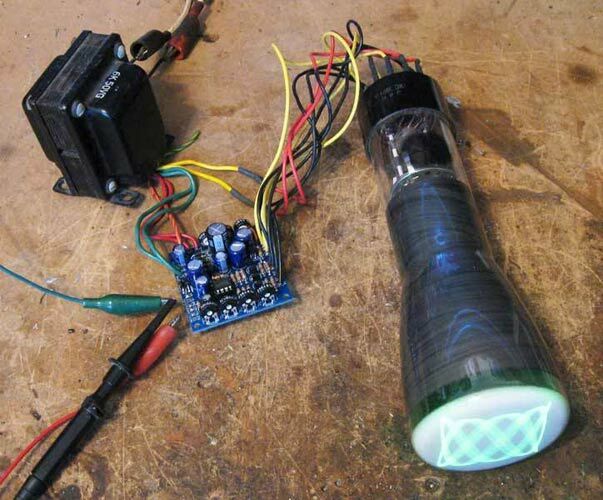 The Hammond 270X transformer 5V winding connects directly to the CRT filament. The 480VCT secondary connects to 240A, 240B, and CT on the PCB. The 6.3V secondary connects to 6A and 6B on the PCB. 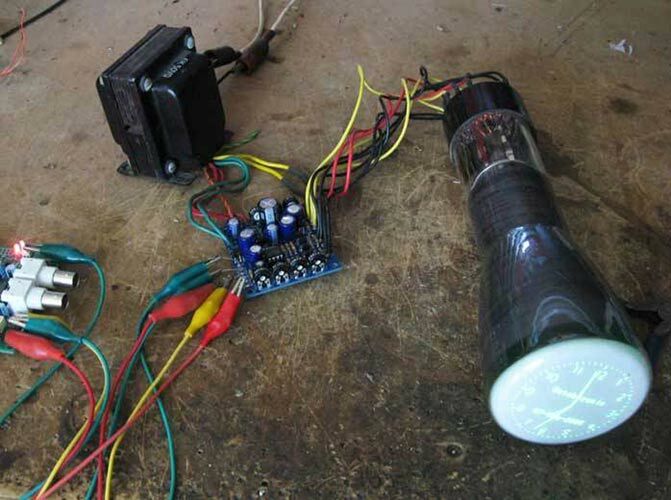 It is recommended that you add a fuse to the primary winding of the transformer. Also, the transformer should be placed behind the CRT to avoid line noise from causing the display to swim. 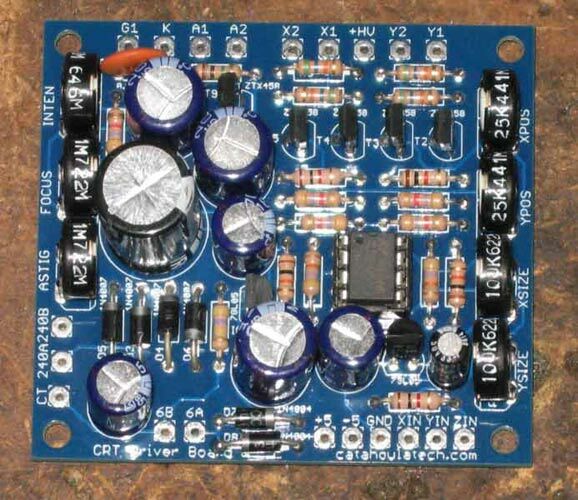 The Hammond 270X transformer is recommended but not a specific required model for powering this PCB. You may choose to use a smaller lower voltage or larger higher power transformer depending on the CRT you are using. Keep in mind that the display size is inversely proportional to the DC voltages so lower voltages can still achieve a large display, but the CRT display will be more sensitive to the Earth's magnetic fields and orientation. Known supported American CRTs include: 2AP1, 2BP1, 3BP1, 3JP1, 3RP1, 5BP1 (dim picture), 5UP1 (dim picture). If the Hammond 270X transformer is used with a smaller CRT then you may need to remove one stage of the negative voltage doubler (replace C16 with a wire and do not populate diode D4) to reduce the maximum negative voltage rail to around -300V. The Russian 3LO1i CRT works with this modification. Board dimensions (approx): 2.5" x 2.25"
Included is a single unpopulated PCB. All other required components to complete the assembly are not included such as the CRT, power transformer, and discretes. The photos above of the assembled board and CRT operation are for your reference only.